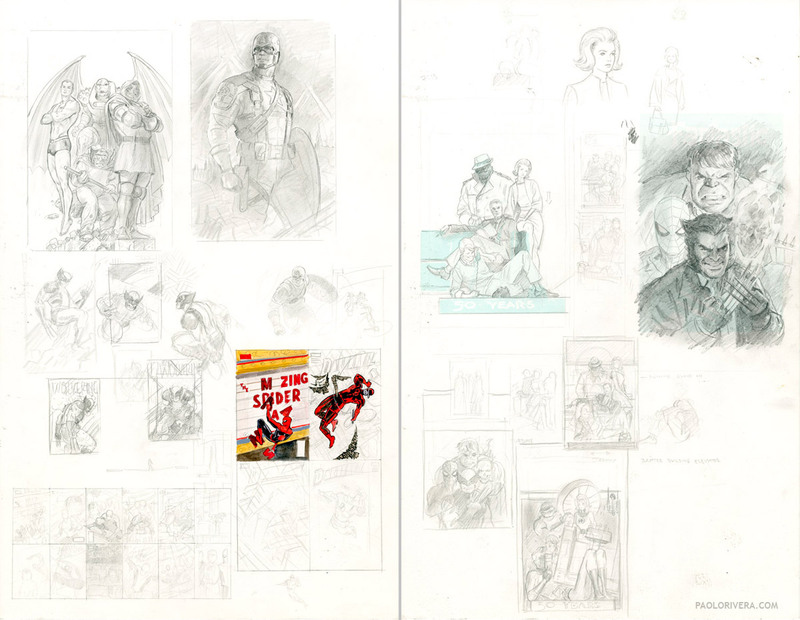 Cover Sketches. 2011. Pencil and watercolor on bristol board, 11 × 17″. I don't really keep a sketchbook anymore, but these are some random sketches for various covers. Most of my comps are digital now, but I'd like to get back in the habit of sketching on paper. We'll see if that happens. You can see these and other covers in my Picasa gallery, which collects all the artwork posted on the blog. I'm off to Atlanta this weekend for a wedding. Got a brand new suit and shoes, too, so nothing can stop me. I may also have a crazy announcement soon. It's been a strange week. I'm imagining MCA, Maurice Sendak, and Vidal Sassoon kickin' it in the afterlife. May they party in peace. Wow. There's some incredible stuff in those sketches. I recognise and have almost all of them. While these are all great, I'm digging the Fantastic Four cover. The arrangement of the characters feels like a classic magazine cover like something Norman Rockwell or JC Leyendecker would compose. Speaking of name dropping, your Reed Richards looks a lot like David Boreanaz. Are you a fan of "Bones" or "Buffy"? Yeah, I was going for a classic 60s illustrations style—something out of Mad Men. As for Boreanaz, my editors actually mentioned that to me when I turned it in. I didn't know who he was, but I can see the resemblance. I posted the reference I used—a photo of myself—in a past Wacky Reference Wednesday.